"Officer Ashe was driving home in Pasco County when he observed an alligator blocking the roadway. He attempted to use his vehicle to scare it out of the road. 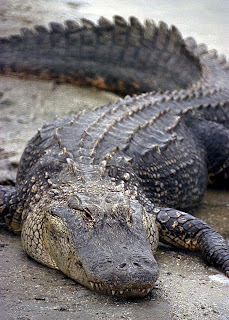 The alligator became agitated and bit his bumper causing approximately $500 worth of damage. Report will be routed to City Claims/Risk Management." But here is a St. Petersburg Times story about the initial report he filed. Maybe he wanted a byline in the paper?